TOKYO (AP) — Japan plans its first aircraft carrier and big increases in defense spending and weapons capability in the coming years, according to new defense guidelines approved Tuesday that cite its need to counter potential threats from North Korea and China and other vulnerabilities. The guidelines approved at a meeting of Prime Minister Shinzo Abe’s Cabinet call for refitting an existing helicopter carrier into a ship that can deploy expensive, U.S.-made F-35B stealth fighters capable of short takeoffs and vertical landings. Japan plans to buy 147 F-35s, including 42 F-35Bs, over the next decade. The guidelines would replace the current defense plan halfway through its intended lifespan and underscore Abe’s push to expand Japan’s military role and capability to make it, as he puts it, “a normal country.” He has long wanted to revise Japan’s U.S.-drafted constitution that renounces war and has already broadened the concept of self-defense to allow Japanese personnel to defend allied military forces as Japan increasingly works alongside American troops. Defense officials say Japan needs higher deterrence and increased missile defense and fighter capability as North Korea’s missile and nuclear threats remains unchanged in the absence of concrete steps to dismantle them, and China’s maritime activity has grown increasingly assertive. The new guidelines say Japan needs to be well-prepared and to show it can withstand threats, noting the archipelago is prone to natural disasters and its coastline is dotted with vulnerable nuclear power plants. 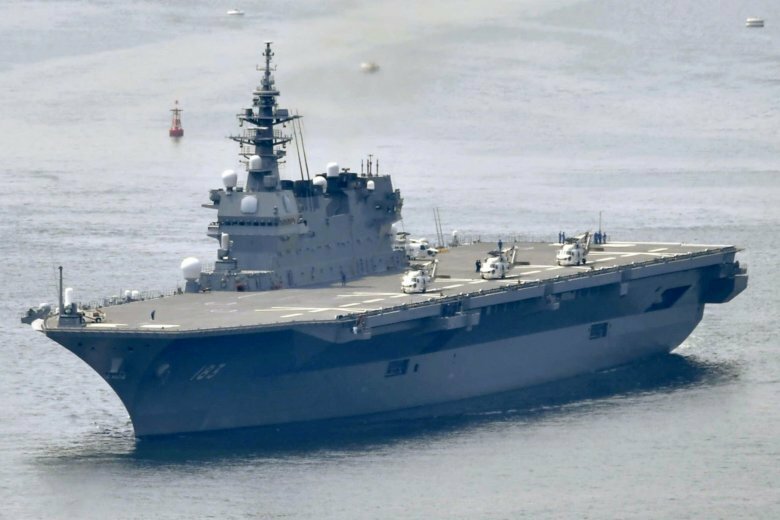 Officials say the Maritime Self-Defense Force’s helicopter carrier Izumo, a 250-meter- (820-foot)-long, flat-top destroyer that can carry 14 helicopters, is set to be refitted as an aircraft carrier. Japan has relatively little land on which to build runways long enough for conventional F-35s, and an aircraft carrier would be particularly useful in the western Pacific, where Japan tries to defend remote islands, including those disputed with China, and to play a greater role as part of the U.S.-Japan alliance. A cost estimate for the refitted carrier wasn’t given. The work would be done over five years and the ship would carry 10 stealth fighters. The refitting of a second helicopter carrier would follow. The step is a major shift to Japan’s postwar naval defense, which has lacked aircraft carriers in part out of concerns that they may remind Japan’s Asian neighbors of aggression by Japan’s wartime Navy. Critics say possession of an aircraft carrier would give Japan a strike capability in violation of its pacifist constitution that limits use of force to self-defense only. Japan, under the new defense guidelines, also plans to possess cruise missiles designed to hit enemy targets, which opponents say could violate Japan’s pacifist principle. China urged Japan to stick to a defense-only policy and peaceful development. “Due to historical reasons, neighboring countries in Asia and the international community have long been highly concerned about Japan’s moves in military and security fields,” Chinese Foreign Ministry spokeswoman Hua Chunying told reporters in Beijing. Japan was making “groundless and irresponsible accusations against China’s normal defense construction and military activities” to play up the China threat, she said. Defense officials brushed off the criticism, saying Izumo will be a multifunctional warship used as an aircraft carrier only when necessary for national defense. Chief Cabinet Secretary Yoshihide Suga said the plan is mainly for fighter pilots in case of an emergency at sea and that it “falls within the minimum necessity allowed under the constitution.” He said the revised guidelines presented what Japan truly needs to protect its people and portrayed what Japan’s future defense should be. The guidelines say Japan needs to beef up its air defense capability in the Pacific, while expanding surveillance in the area. The Defense Ministry says Japan plans to purchase 105 conventional F-35s and 42 F-35Bs to replace some of its fleet of F-15s. The big price tag for the jets — a F-35B costs about 10 billion yen ($90 million) — will drive up Japan’s defense spending, which has already climbed steadily for six straight years since Abe took office at the end of 2012. Japan plans to spend 235 billion yen ($2 billion) to buy a pair of land-fixed U.S. missile defense systems, Aegis Ashore, as well as other American missile interceptors. The Cabinet, under the guidelines, also approved a new Medium Term Defense Program requiring a record five-year defense spending of 27 trillion yen ($240 billion) beginning in 2019, up more than 2 trillion yen ($17.6 billion) from an earlier five-year defense budget. As Japan comes under pressure from President Donald Trump to allow more exports from the U.S., purchases of costly American weapons would be a way to reduce the U.S. trade deficit, while enhancing military cooperation between the allies. Japan’s U.S. arms purchases have surged, and the Defense Ministry came under criticism by the government’s Board of Audit for agreeing too easily to Washington’s hefty asking price. The guidelines said Japan will seek more cost-efficient purchase of advance-capability U.S. equipment, while pushing for more joint research and development. Buying more American weapons, however, would be a setback for Japan’s fledgling defense industry and its hopes to develop its own replacement of F-2 fighter jets are uncertain. The guidelines did not mention whether the F-2 successor would be made in Japan or jointly developed. The guidelines also called for setting up a unit specializing in space, cyberattacks and electronic warfare, while integrating the ground maritime and air forces to better coordinate operations. Japan should aim for a unified, simultaneous “multi-dimensional and unified defense capability” that breaks away from the conventional concept of ground, maritime and air defense, the guidelines said. As the fast-aging country faces a declining population and workforce, Japan will accept more women to join the self-defense force, postpone retirement age and promote research and development of robotics and unmanned equipment, the guidelines said.